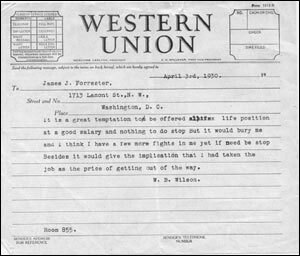 William B. Wilson resigned from the office of Secretary of Labor at the end of his term, March 5, 1921. On March 4, 1921 he was appointed a member of the International Joint Commission to prevent disputes regarding the use of the boundary waters between the United States and Canada, and served until March 21, 1921, when he resigned. The records the researchers have consulted are unfortunately sketchy on the last part of Wilson’s life. 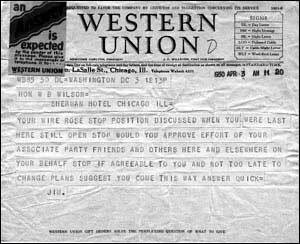 The telegrams above illustrate Wilson’s commitment to integrity. In 1926 he made a bid for election for the U.S. Senate and was defeated. Wilson contested the election and below is the Record of the Committee on Rules and Administration and Related Committees that pertain to the election. 17.28. William B. Wilson – William S. Vare of Pennsylvania, 69th – 71st Congresses (1926-29): This complex case initially revolved around questions of campaign financing, particularly in the 1926 Pennsylvania Republican primary, but expanded during the course of the investigation into several precedent-setting areas. In that primary, Vare defeated the incumbent, George Wharton Pepper. Wilson was the Democratic nominee against Vare in the general election, and after his defeat, he contested Vare’s election on the grounds of corrupt practices, illegal registration and voting, and other irregularities. In a break from customary practice, the case was investigated by a special committee of the Senate as well as by the Committee on Privileges and Elections. In 1929, it was determined that neither Vare nor Wilson was entitled to the seat, and, ironically, the seat was filled when Governor John S. Fisher appointed Joseph R. Grundy to the remainder of the term. Grundy, a wealthy manufacturer, was a central figure in the investigation of the primary for allegedly contributing approximately $400,000 to Senator Pepper. Records (4 ft.) of the case are in the committee papers of both the 70th (70A-F20) and 71St Congresses (71A-F24) and include minutes and notes of committee meetings; unpublished transcripts of hearings (vols. 1-20 in 70A-F20 and vols. 21-25 in 71A-F24; vol. 21 missing); unpublished transcripts of arguments, May 23-29, 1929 (71A-F24); and petitions and briefs of candidates, Senate resolutions, campaign expenditure data, exhibits presented at the hearings, and other records (71A-F24). He had worked as an arbiter in Illinois coal fields before his death. William Bauchop Wilson died aboard a Washington, D.C.-bound train near Savannah, GA. on May 25, 1934, after a month’s stay in Florida. Blossburg and the whole United States paid their last tribute to Wilson on June 3, 1934, when services were held at the Ferniegair Farm in Blossburg. Wilson is buried along side his wife, in Blossburg’s Arbon Cemetery, not far from the burial site of his mother, father, daughter Nellie, and grandfather John Bauchop. Also buried next to Wilson is his son Adam, Adam’s wife Gertrude, and his daughter Agnes Hart Wilson who died during her own race for the U.S. Senate in 1928.